This powerful infographic shows the impact of the internet on education. I am unashamedly an eager proponent of the use of technology in education. I passionately enthuse about the role of social media and am constantly amazed at the arsenal of technical gadgetry teachers now have at their disposal. Assistant : May I help you? Lady : Yes, I want to look at the computer. Assistant : What would you like to do? Lady : I want to use the computer. Assistant : Would you like to print something? Lady : No, I want to find something. Assistant : What would you like to find? Lady : I want to find a job. Assistant : So you want to use the internet. At this point the shop assistant walked the lady over to one of the computers and explained how the payment for internet services would work. She then left the lady and came back to serve customers. I watched with interest as the lady opened Internet Explorer and discovered that Google was the homepage. She typed in “Worcester jobs” and waited. After a minute she realised that nothing was happening and looked around helplessly. Fortunately for her at that moment a friend of hers entered the shop. The friend showed the lady that she had to use the mouse to push the “Google Search” button. As the search results came up showing over 3 million results she sat staring at the screen clearly overwhelmed. Her friend suggested clicking on one of the search results and they both then sat looking at the resulting site. They then returned to the search results and the process repeated. This went on for about 10 minutes. It appeared to be a complete waste of time as at no point was anything transcribed from the sites or email enquiries sent. After the final site visit the lady visited the counter, paid her money and left. It was painfully obvious that this woman had little or no knowledge of how to use a search engine properly or even how to navigate around an internet browser. I could not help but wonder what kind of job she was looking for. There cannot be many jobs in the marketplace today that don’t require some sort of basic digital literacy and so I fear that her chances of landing a job are drastically reduced if what I saw reflected her ability on a computer. Although I am tired of the clichéd “preparing our pupils for the 21st century” (we’re 10 years into the 21st century – its arrived! ), it does ring true that if we are serious about sending our pupils into the world with the knowledge, skills and values required for success, we have no choice but to be taking the teaching of digital literacy very seriously indeed. As much as it is nice to speak of what teachers can do with Web 2.0 tools and interactive software and so on, the first priority in the classroom must be to teach our children to use a computer. In a middle to upper income stream school, we can safely assume that most of our children will know that basics of keyboard and mouse use, and have some experience in basic word processing skills. They will most likely also have explored the internet at some point and will have used various interactive tools such as video games in their lifetime. There are however many communities in our country where this is not the case. Communities where computer use is considered a luxury and where the priority is survival not bandwidth. The digital divide is very real. How we solve it is a complicated and lengthy process which must involve government departments, NGOs, corporates and so on. In the meantime, schools have to be teaching the basics. I salute the Khanya Project for their efforts in this (see this post as well). I still cringe at the thought that there are 4,7 million illiterate adults in our country and a further 4,9 million adults who are functionally illiterate (figures from Project Literacy). If this figure is to improve we have to continue improving the literacy programs in our schools and at the same time bring digital literacy into our curricula and classroom practice. This has to be a priority for all those involved in education and for any who care about the future of our wonderful land. Magic Tech Or An Expensive Paperweight? This photo and many like it can be found in the Great Quotes About Learning And Change group on Flickr. Bridging The Digital Divide – Is It Working? I came across a news article published by the Western Cape Education Department which speaks of their success in rolling out computers to all state schools in the Western Cape through the ambitious Khanya Project. When one considers the vast differences in socio-economic status which bedevil the education system in South Africa, this is indeed a remarkable achievement. However the article states that the installation of these computers will bridge the digital divide and it is with this sentiment that I would argue. I do not believe that bridging the digital divide is simply putting in banks of computers in schools. The teachers in these schools need to be taught how to use these computers to go beyong the Google research-type project. Are the pupils learning to utilise social networks in responsible and safe ways? The recent OuToilet saga would seem to indicate that many of our pupils do not have the maturity or online safety awareness to cope with the reality of a networked world where privacy is becoming a very real issue. Do our curricula incorporate the teaching of IT skills beyond the basic usage of word processing? Are we teaching digital citizenship as a core subject to prepare our pupils for a world in which these skills are no longer an optional extra? Do our teachers feel competent enough to teach these skills to their pupils or do they feel that they are in fact the ones who need to be taught? 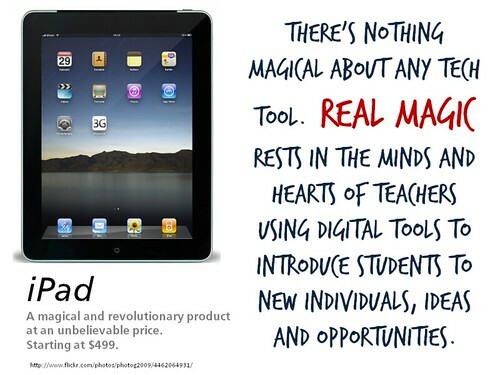 There is so much that can be done at a very basic level with technology in the classroom. The Khanya Project’s investment into WCED schools should mean that the Western Cape should be leading the way in technology integration – but is it? Significant headway has been made and the folks at Khanya should be congratulated on what they have managed to accomplish. However I would argue that all the investment in hardware and software will eventually come to naught if our teachers are not equipped properly and our principals do not have the vision or knowledge to make it a priority in their schools.